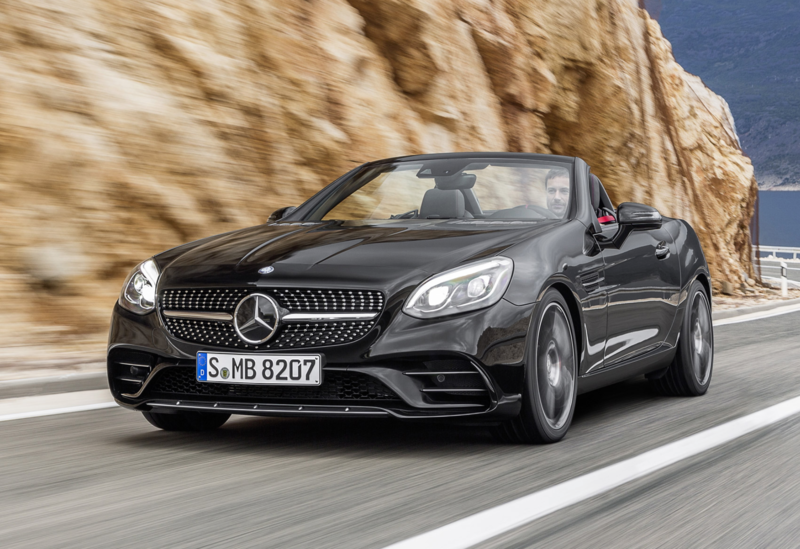 Mercedes-Benz today unveiled the 2017 SLC, which is a heavily revised version of the SLK roadster, prior to its public introduction at the 2016 Detroit Auto Show. The updated roadster will be offered as the Mercedes-Benz SLC300 and the Mercedes-AMG SLC43. The SLC300 will be powered by a turbocharged 2.0-liter four-cylinder making 241 horsepower and 273 pound-feet of torque. The SLC43 will get a twin-turbocharged 3.0-liter V-6 with 362 horses and 384 lb-ft of torque. 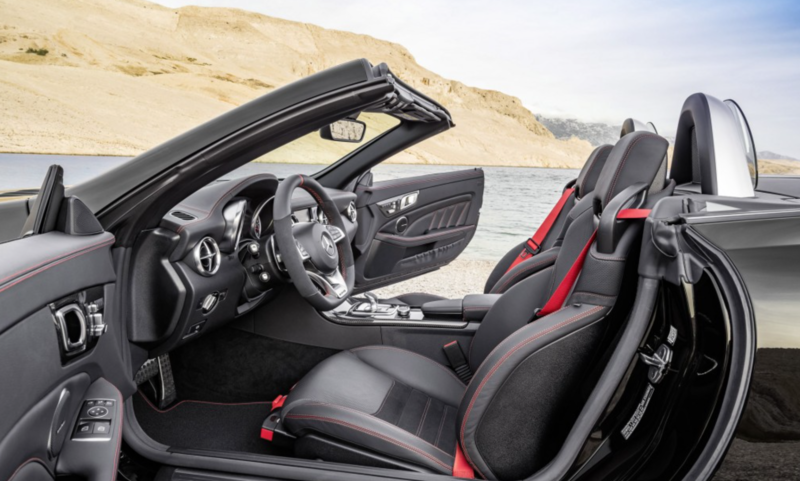 Mercedes quotes 0 to 60 mph times of 5.7 seconds for the SLC300 and 4.6 seconds for the SLC43, with top speeds of 130 mph and 155 mph, respectively. Both cars will come with Mercedes' 9G-TRONIC nine-speed automatic transmission. That represents a completely revised powertrain lineup. 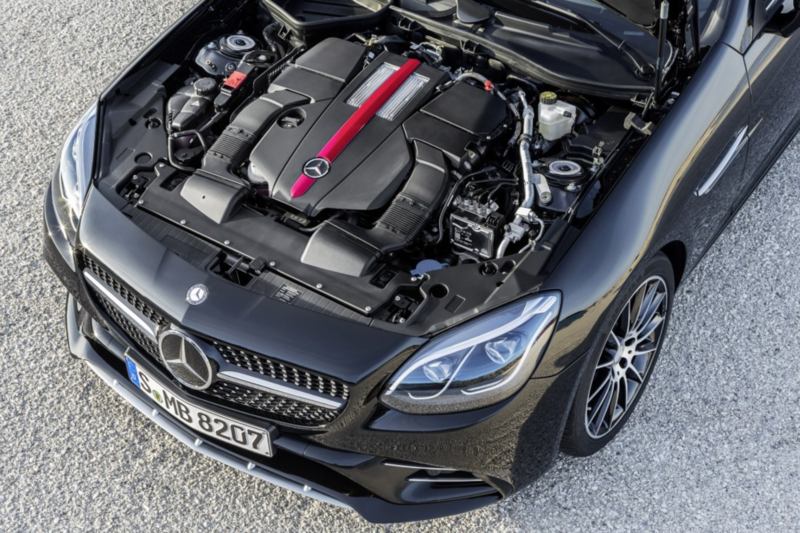 The current SLK is offered with a turbocharged 201-horsepower 1.8-liter four-cylinder in the SLK250, a 302-horsepower 3.5-liter V-6 in the SLK350, and a 415-horsepower 5.5-liter V-8 in the SLK55 AMG. Transmission choices include a six-speed manual and a seven-speed automatic for the SLK250 and a seven-speed automatic for the other models. Both revised models will come standard with Mercedes' Dynamic Select system, which adjusts the parameters of the engine, transmission, steering, and, when possible, the suspension with the press of a button. The SLC43 will feature a modified version of the AMG sport suspension from the SLK 55 AMG, and the AMG Ride Control suspension--with adjustable dampers--will be optional. The SLC300 will offer a Dynamic Handling package, which also gets adaptive dampers. Several chassis and suspension updates should improve the performance of the SLC43. The brakes are larger, and the mountings for the engine and rear axle gear unit are stiffer. The three-link front axle gets stiffer steering knuckles, revised damping, and increased negative camber. The four-link rear suspension also has revised damping and increased negative camber, as well as specially forged aluminum track rods. An optional limited-slip rear differential promises better acceleration out of corners, better acceleration from a stop, and greater stability at speed and while braking. Inside, both models have a new sport steering wheel, a new instrument cluster, and aluminum trim parts with a carbon-fiber finish. The center screen increases from 5.8 to 7.0 inches diagonally. The leather upholstery gets design tweaks as well, with perforations on the shoulder area, and contrast piping and stitching. New saddle brown and platinum white leathers will also be offered. Styling is also updated. The front end gets a steeply raked radiator grille with diamond mesh. The lower fascia takes on a new shape as well. The power top carries over, but Mercedes says it is easier to use and can be operated at speeds up to 25 mph. Mercedes says the name change "acknowledges the traditionally close relationship with the C-Class, from which much of the roadster's technology is derived." We find that to be a bit of a stretch. However, the changes to the SLC promise a better a more engaging car than the already likable SLK. We'll have more when the SLC is unveiled at the Detroit Auto Show, which gets underway January 13. In the meantime, see what else will be appearing by visiting our dedicated hub.